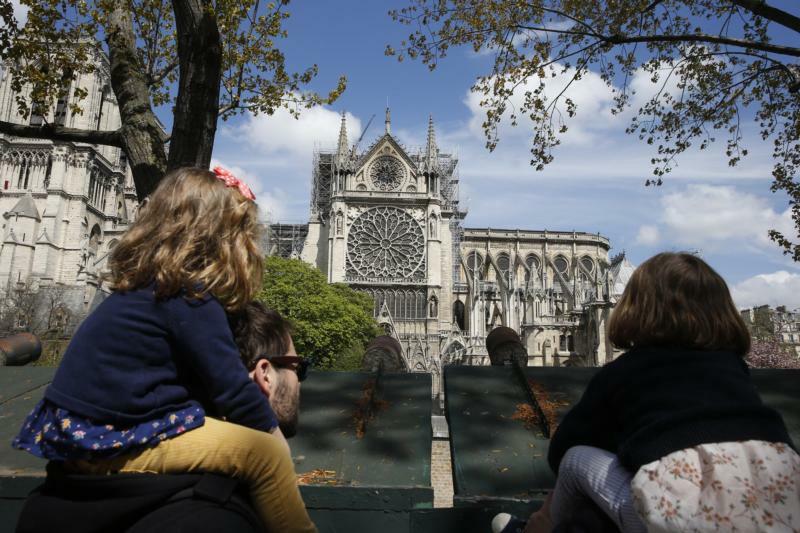 The horrific fire that destroyed parts of the Cathedral Notre-Dame de Paris on April 15 captured the attention of people worldwide. The spire collapsing into the burning roof has already become the iconic image of the disaster. Even while the fire raged, the French vowed to repair the 856-year-old church, and governments and individuals around the world pledged to aid in its restoration. The varied reactions were interesting because they revealed the mentalities of the individuals uttering them. Some mourned the fire as a destruction of history, or a disfigurement of a beautiful structure, or the marring of a symbol of the French nation. I found the reaction of French Catholics to be most interesting. To them the cathedral was a holy place, and while it burned, they prayed and sang hymns. They reacted with faith. The partial destruction of Notre-Dame de Paris reminded me of another beautiful house of worship that was built, destroyed, rebuilt, renovated and destroyed yet again: the Temple in Jerusalem. The first house of God in Jerusalem for the Hebrews was Solomon’s Temple, which existed between 1000 and 587 B.C., until it was destroyed by the Babylonians. After a time in exile, the Jews were allowed to return to their homeland and built the Second Temple. When Notre-Dame is rebuilt, will Catholics react the way the Jews of that time did? Many of the priests, Levites, and family heads, the old men who had seen the former house, cried out in sorrow as they watched the foundation of the present house being laid. Many others, however, lifted up their voices in shouts of joy, and no one could distinguish the sound of the joyful shouting from the sound of those who were weeping (Ez 3:10-13). The Second Temple was finished in 515 B.C., but it could not be compared in beauty to Solomon’s Temple. The despotic King Herod the Great decided to expand and rebuild the Second Temple to make it more worthy of his grandeur. The temple itself was completed relatively quickly about 20 B.C., but construction of the remainder of the complex continued for decades. Herod’s Temple is the one that Jesus and the Apostles knew. Jesus left the temple area and was going away, when his disciples approached him to point out the temple buildings. He said to them in reply, “You see all these things, do you not? Amen, I say to you, there will not be left here a stone upon another stone that will not be thrown down” (Mt 24:1-2). As Jesus prophesied, Herod’s Third Temple was destroyed by the Romans during the siege of Jerusalem in 70 A.D. The Byzantine emperor “Julian the Apostate” gave permission for a fourth temple to be built, but that effort was thwarted by an earthquake in 363 A.D. Since then there have been no serious efforts to rebuild the Jerusalem Temple, the site of which is now occupied by an Islamic shrine and mosque. Catholics love their churches and (usually) take great care to make them beautiful. When one of them is destroyed or closed, we mourn. They are, rightfully, places to be treated with respect and care. Nevertheless, Catholics balance that love for their physical sanctuaries with the spirituality that the true church consists of the Believers as a whole, for, Do you not know that you are God’s temple (1 Cor 3:16),and, you yourselves like living stones are being built up as a spiritual house (1 Pt 2:4-5). All things built by human hands will pass. Our churches are here for a time and a season for but one purpose: to point to the Temple that is eternal. I saw no temple in the city, for its temple is the Lord God almighty and the Lamb (Rv. 21:22).